Pub in Battersea. Was in the 2007 Good Beer Guide but not the 2008 one. The 2007 Good Beer Guide describes the menu as “adventurous”. 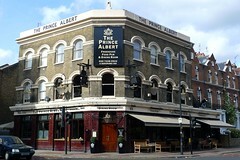 Previously owned by Punch Taverns, it was bought by Geronimo Inns in mid-2009. Last edited 2013-05-10 07:47:52 (version 11; diff). List all versions. Page last edited 2013-05-10 07:47:52 (version 11).